‘Γao (the Γenerator) gives birth to yin≈form≈space and yang≈motion≈time. Both merge into Energy (Qi), the source of all creation.’ Taoism, on the 3 conserved elements of the Universe, space, time and its energy combinations. Abstract. By far, the civilization most in tune with the laws of the organic Universe is ASIA, reason why as the ORGANIC vital Universe is about survival, for those whose information MIRRORS its formal scalar laws of organization of parts into wholes, based in the duality of energy and information ‘arrows’ of cyclical time futures… ASIA is the most SUCCESSFUL civilization in terms of survival. Indeed, ‘Asia’ represents today, if we account partially for the times in which large tracts of Indonasia shared similar beliefs, 1/3rd of the human population; 2/3rds with Indonasia, which had in the Neolithic and pre-Ayran, and Buddhist ages a similar more ‘vital’, feisty Shiva=yang vs. visnhu=yin duality reflecting the laws of the Universe. TO KNOW PAYS in life dividends, when we compare those survival rates, with the most WEIRD culture in terms of mimetism with the laws of Nature (Judaism, Germanism) based in infantile, selfish ego-trips of superiority over Nature and other human beings, who try to ‘cheat’ those laws, ab=using History and Gaia with metal-memes, weapons or Go(l)d to get the ‘answer back’ of the action-reaction processes of reality in the war and holocaust cycle. So Taoism and Buddhism were also CULTURES that denied power through vile Metal, living with Nature, preying to Duality, rejecting wealth and living in communion with the absolute and its 5D laws. That similitude is so close in the general concepts that one of my first treatises on the scalar 5Dimensional organic Universe was called ‘scientific taoism’. How those laws were expressed in its initial cultures is obvious: Taoism first, and then Buddhism, the ‘purifying version of Hinduism’ born in China, became the official religion of all Nations of Asia. The origin of Taoism though is much more ancient, as it seems clearly to be the ‘vishnu vs. Shiva’, colder, more rational, less vital ‘Northern’ view of Asia and its mongoloid cultures of ‘higher informative, verbal, brachicephalic’ less ‘visual, literal, white dolichocephalic’ understanding of reality. 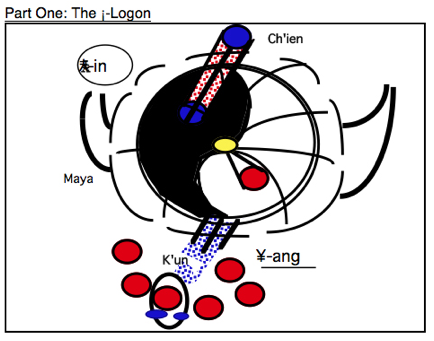 In any case its first written, clear expressions happened in the counter-reaction to the Shang invading White Russian charioteer hordes with the Chou Bronze late age (which corresponds in the west to the Iron cycle and ends in China with the arrival of iron swords and cavalry to the Chin western barbarian kingdom that will destroy the original Chinese civilization and forbid taoist books that were not technological. The taoist culture of the mongoloid, cyclical verbal humind was the height of philosophy of science prior to the western evolution of the mechanist, scientific method, which unfortunately deformed our concept of an organic Universe of space=yin+time=yang beings, into lineal, entropic time, best suit to measure the lineal speed of its cannonballs. To fully understand Taoism thus is easier today, after more than 2000 years of extinction as the official culture of China to read first the 5D3 post on the modern philosophy of science that has continued in its tradition. The reward of having a properly tuned vision of the Universe of course is a balance with that Universe, which ensures our survival – reason why China is the most successful survival culture of mankind, while in the opposite extreme, the denial of the selfless harmony of the Universe is the sure path to extinction, as our ‘ego-centered’ beliefs confront the selfless Universe of infinite points of view – hence the jewish go(l)d cult(ure) is the less successful in terms of survival of all the cultures of mankind – a clear warning for our non-future as capitalism has now triumphed even in china erasing most traces of its ancient traditions. The opposition between taoism and the organic Chinese civilization vs. the western world of lineal, ego-centered animetals run in that sense very deep in the history of mankind. Unfortunately taoism lost the battle earlier on when in the III BC century, Chin, the eastern ruler of the C’hin empire brought iron and horses and coins to the frail and unified China to the rhythm of 6 illions corpses establishing death penalty to all who had a taoist book except those on technology. So China ever since would increasingly loose its understanding of the foundations of the organic Universe so well describe in philosophical taoism. In the graph the highest informative understanding of mankind took place in the neolithic, mongoloid brachicephalic, verbal, chinese taoist culture, before lineal metal-weapons and the animetal white man reduced our knowledge to pure instrumental memes and lineal science. Taoism ultimately IS the most advanced pre-scientific culture of mankind as it plugs in directly with the essence of reality. As my work was initially called scientific taoism when I used to sign Lao-San (: during my life in Far East Asia in my youth), and then I became chair of Duality at the world congresses of systems sciences, my relationship with the philosophical principles of taoism – cyclical time, a Universe made of two substances/motions space and time, the organic nature of all systems where individuals are secondary to networks and the isomorphism of all species of the Universe, all made of those 2 parameters, for the reader who is truly interested in a XXI century philosophy of science based in those principles I advice the reader to go to http://www.unificationtheory.com (and don’t worry for the lack of ‘certificate’, the site is clean). LET US then start with a proper translation to the modern jargon of cyclical spacetime science of the classic texts of taoism. “The Tao which can be named is not the eternal Tao. The name which can be uttered is not the eternal name. [The Function of] Existence cannot be expressed. If perceived his virtual form will fade away. The species who can be named=perceived is not the eternal being. The logic of Existence has no visible form. And when both forms are shaped in existence, the function gives birth to 10ˆ 10 species. Energy who has no will wonders at the game of creation. Energy who exists in present and searches for the effect will see nothing but the glare of light senses. Energy and information are the organs of Existence. Yet both parts are different. Gates to all sensorial wisdom; Information perceives energy. Time cycles feed in energy species, who die as they knot into form. But when both organs merge in harmony a stable specie be=comes. You should not stop herds of species that follow their energy path. Leave them to the wisdom of creation and they will not feed on your form. In the world we all perceive the beautiful and the good; the short and the tall. The possible future and the withering past. Time beings perceive the space in which they stand; the energy that gives them life. BEcause the big predator feeds in the short one. And the ugly is formed for the beautiful to compare. And the plane of energy allows the perceptor of Time to reach i=ts height. As past and future follow each other, so new existences will die and will be=come. Among so much Games of creation, the wise man perceives the silent Principles and the wisdom of i=ts herds of existence. In this manner the perfect man orders his world and tenders for nature, and let’s his shapes follow the eternal game of creation and reproduction of forms. He is the true Master that loves the freedom of creative Existence, and takes from creation only what he needs, and cares for. You shall not search for wishes beyond your human form. You shall not make propaganda of vile consume. You shall not infatuate your people. and give them desires beyond the natural senses of man. You shall not make greed the object of your Existence. Because complexity brings death and r=evolution, you shall not fill of light and air the mind of men, but give them the earth that feeds, and Harmony between their minds and bodies, within the natural senses of man. The man of wisdom empties of impossible dreams the simplex man. The man of wisdom, let’s Existence follow his path. The true master gardens the species that Existence has born. Virtual, never physical, existence is eternal by his lack of form. Because in the emptiness of a closed Jar, all the water of Existence can pass by, when Existence flows. So happens to all forms of present, slaves of the Yin-Yang Game. Because only the Game of Creation, the game of existence is before our time and Space were created. In the understanding of China as the most accurate verbal form of objective truth, and Taoism in its purest form [Tao Te King, I ching, 8-fold Yin-Yang] as the most correct expression in mathematical=Tao thought of the game of times, we have to abandon our subjective human pov, or western path to the truth. For one thing, a culture like the Chinese culture, and its linguistic objective perception of reality, does not accommodate easily to the limits of the subjective program of western thought. From the pov of Tao, the absolute God [perceived in similar terms by pre-Colombian cultures] reality is always a partial perception of Totality. And totality the ultimate mover of reality. Tao is therefore superior to all human will, and Tao has to be obeyed. In this the Chinese, unfortunately are right: there is no way in which a function of existence can bend the force of Tao, the constant transformation of information into energy, and vice versa, of yin into yang. However while the western world and its Aristotelian perception of history merely accelerates mankind towards extinction by accelerating the translation of human energy into metal form; the Tao way by not acting allows the flow of the Universe to direct man much slower to the same end. And so the result of both decouplings is different: the western wrong actions are leading mankind to death. The Eastern philosophy would let the Universe by itself, create the bad things, and man in harmony with nature create the good things. So Taoists repressed gunpowder weapons, and westerners multiplied. Taoists repressed with Confucian schools the power of warriors; and westerners multiplied. The 8 bagua which translated fully the 8 phases of cyclical time, explained below. We shall here translate some basic laws of cyclical time EXPRESSED in the original taoist culture. The laws are explained in full modern systemic thought on the section of General Systems: Organisms vs. Mechanisms. In graph, the world cycle of existence divides in 3 ages that divide in 8 phases, between birth and extinction, in which the 3 physiological networks that make the being, $t-limbs, ∑∏-reproductive networks and ð§-informative networks, are either in its Spatial, static, yin (–) or moving-activ, yang (__) state. Thus the being first activates its 3 networks, first its limbs/potential, then its particles/heads, and finally its reproductive body-wave, reaching the maximal power in ‘Heavens’… The darkness of youth ends and the plenitude of light starts afresh, as the system settles its mind and reproduces… But then immediately after starts its inverse slow loss of capacity. First its limbs/potential motions will fail, then it will experience its last reproductive Indian summer, and finally only the ‘quiet’ still mind-space will remain, moving backwards to the memories of its past, retracing its paths as a standing wave. So the 3 systems collapse in the 8 cycle of 9 years; to explode back in a thunder, completing a 0-sum between birth and extinction. This simple never quite understood game fully divides the world cycle of time, and can be applied to all kind of systems, while its spatial symmetry is the origin of many 8-systems of creation in nature, when we depart from 3 single elements in 2 possible states. After the informative Generation (in black), as a seed in the placenta in the Human T.œ, which being of a lower scale in space, ∆-1, has a decametric faster speed in time. So instead of 9 years it is a period of 9 ‘moons’=months of gestation, the being is born emerging to live in the ∆º scale where it will go through 8 phases for a 72 years human generational cycle. And each age distinguishes itself for the spatial static or active, temporal stage of its 3 physiological networks, reflected in the trigrams, from above (particle-head), to the middle body wave to the lower moving limbs/potentials. In man they are the babyhood 0-9, when only the limbs are activated, it is the ‘thunder’ age in the taoist tradition. Then after 9, till 18, the childhood, age of reason starts and the mind also activates. It is the age of flame. Finally the whole being becomes activated in the adolescence, it is the age of Heavens, between 18 and 27 – the zenith of the organism. The 8th baguas, combinations of 3 physiological networks in two states, static space/form — and moving time __ yang, gives us 8 sub-ages of a world cycle. It was the highest taoist understanding of I Ching – the game of time-changes that define the world cycles of past-present-future of all systems as a potential block of similar phases – in the graph corrected to its temporal order starting from the generation as thunder to its death as earth: despite the fact that its individual forms approaches ∞ all of them go through the same phases as they define the states of its 3 networks. Now, we know the precise meaning of them, and we shall study in a scientific form, as yet ‘another’ specific numbered development of the super organism’s world cycle. To which degree taoism understood the 8 phases of existence as a cycle of two poles in eternal zero sums, we don’t know. As all information that comes to us is after the technological chin empire (graph above) that destroyed it wisdom. I am of the opinion that after Ch’in, the first animetal chinese master destroyed likely the highest ever agricultural neolithic culture of mankind, the knowledge as lost (death penalty to anyone who kept a book of taoism, except in technology), and once more the tree of metal won and degraded mankind. The baguas today are merely Feng shui bull$hit and the two orders we have received from the past are NOT temporal but spatial, based in opposite configurations and S=T symmetries (LEFT graph). So they are used to generate spatial systems as the Universe does with its symmetry between motion and form (we have taken here — as the symbol of form-space and __ of motion-time though the inverse representation is often found in latter taoist texts). One fact though on the tradition of I Ching seems to show there was a certain understanding of Bagua when we consider the ‘properties’ given to the 8 baguas/ages of existence, associated to the 8 symbols of ‘gaseous youth’ (thunder: initiation; fire: awakening; heavens: plenitude), which are excellent descriptions of those 3 phases of youth. A TAOIST SYNOPSIS OF THE UNIVERSE. All in all the renewal of taoism and its ‘foundations’ of the Chinese culture – today erased into a digital monster, by imitation and competition with America – can be read in the post on 5D, which defines the Universe as a taoist master would surely understand it if we could resurrect it, prior to the extinction of the culture by the Ch’in emperor, who forbade all taoist books except those of technology (animetal zeal at its best).